Transient Line Source Method - Explore the History of the TLS Method. How does Transient line Source Work? where k is the thermal conductivity (W/mK), q is the heating power of the needle, and a is the slope of the line for temperature rise over the log of time. Where did Transient line source Originate? The first mention of the theory behind what would become the transient line source method appears in work by Schleiermacher in 1888, who at the time was working on determining the thermal conductivity of gases. However, it would not be until over 40 years later, when Stalhane and Pyk used a cased probe during their development of the transient hot wire method in 1931, that the idea was expanded upon. As with the development of many scientific techniques and theories, once an idea is suggested it is often developed by many different people. This was the case for the transient line source method and the thermal probe during the 1950s. 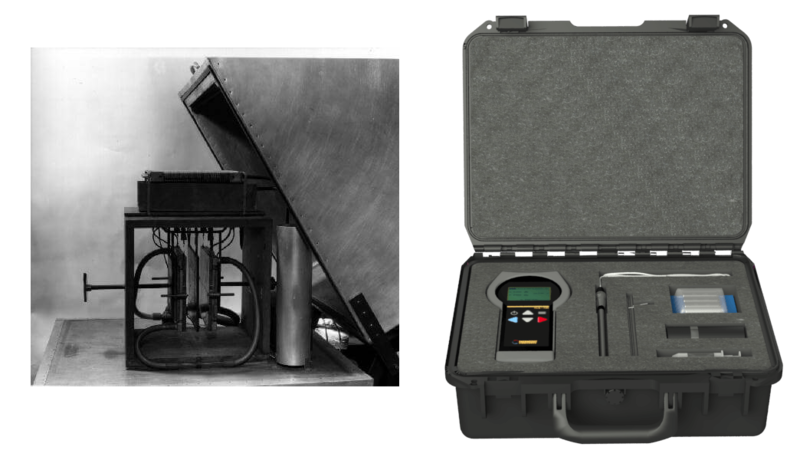 In 1950, Hooper and Lepper elaborated on the theory, and by 1953 the first official thermal probe was produced by Hooper and Chang. The 1950s was a decade of discovery for the TLS testing technique, with many researchers testing the ability of the method to produce thermal conductivity values that agreed with ones obtained by more established methods on numerous different materials. What is the benefit of the Transient line source method? 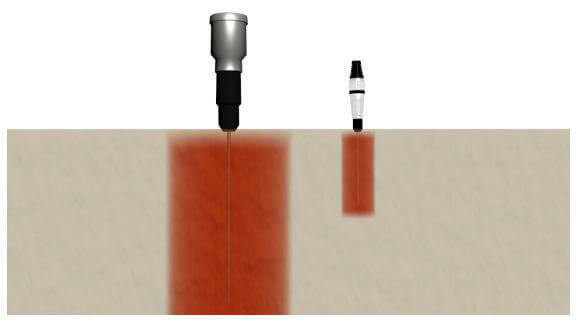 The concept of a portable probe that required little set up, could perform tests in the field, and resulted in minimal damage to the sample was highly desirable in a field where the equipment had always been large and laboratory based (Figure 1). The transient nature of the method was also preferred by many in the thermal conductivity testing community, as it did not require that the introduced heat come to equilibrium with its surrounding before calculations could be taken and therefore had a much shorter test time. This was particularly important for research on materials containing water, as scientists were frequently frustrated by moisture redistribution during the long steady state test times influencing their results. Figure 1. Comparison of the portability of a TLS system (Thermtest Portable’s transient line source product, the TLS-100) on the left, versus the laboratory set up of the guarded hot plate method on the right used extensively at the time of TLS development. Where is transient line source used? The measurement of thermal conductivity of soils is an area where the TLS system has excelled (Figure 2). The use of the technique for this type of testing can be traced to the late 1950s and early 1960s, and there are numerous excellent examples of these tests in the scientific literature. In 1970, HF Winterkorn produced a report for ASTM international where he detailed a method using a TLS system to measure the thermal resistivity of soil remarkably similar to the one used today. Also in 1970, E Penner tested the ability of a thermal probe to measure the thermal conductivity of frozen soils. He compared the data that he received from the probe with estimations from the DeVries approach, and got reliable measurements under -2°C. Figure 2. Diagram illustrating the use of a thermal needle manufactured by Thermtest Inc. to perform thermal conductivity measurements on soil. What Have We Contributed to the Transient line Source method? Today, Thermtest Inc. is proud to be a part of the long history of research and development on the transient line system with their own TLS products. 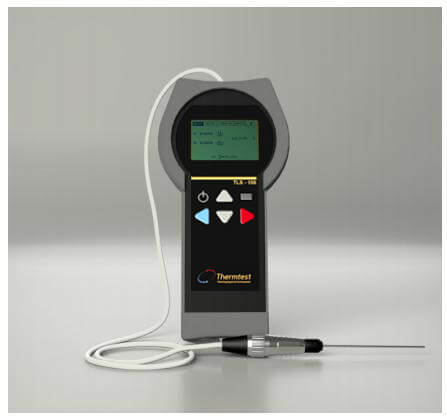 Thermtest Portable offers a transient line source product, the TLS-100, to test the thermal conductivity and thermal resistivity of solids and powders (Figure 3). This machine is inexpensive in comparison to traditional thermal conductivity equipment, compact, portable, and is highly applicable to studies in the field. It has an accuracy of 5% and a reproducibility of 2%, test times of under 2 minutes, and can work in a temperature range of -40°C to 100°C. Thermal conductivity is measureable in a range of 0.1 to 5 W/mK. The TLS-100 is covered under the current ASTM D5334-14 standard. This product will contribute to the expertise and development of thermal conductivity measurement in the years to come, and is excellent for use on pipeline, underground power line, and other environmental projects due to its superior soil testing capabilities. Figure 3. Thermtest Portable’s TLS-100. ASTM D5334-14, Standard Test Method for Determination of Thermal Conductivity of Soil and Soft Rock by Thermal Needle Probe Procedure, ASTM International, West Conshohocken, PA, 2014, www.astm.org. Penner, E. 1970. Thermal Conductivity of Frozen Soils. Canadian Journal of Earth Sciences. 7(3): 982-987. Pilkington, B., de Wilde, P., Goodhew, S., Griffiths, R. 2006. Development of a Probe for Measuring In-situ the Thermal Properties of Building Materials. The 23rd Conference on Passive and Low Energy Architecture, Geneva, Switzerland, 6-8 September 2006. Winterkorn, K. 1970. Suggested Method of Test for Thermal Resistivity of Soil by the Thermal Probe. ASTM: Symposia Papers and STPs. DOI: 10.1520/STP38515S. Woodside, W. 1958. Probe for Thermal Conductivity Measurement of Dry and Moist Materials. Amer. Soc. Heating Air-Conditioning Engrs. Journal, Piping and Air Conditioning, 30(9):163-170.